Today, I will start this post by saying that GREY MATTERS, especially when it is paired with black and red-the iconic combination-. One of my recently purchased pair of shoes, these snake printed pumps, are displayed in my today's look, as well as this NEW coat (courtesy to Sheinside.com). What I love about this coat is that it has that menswear influence and clean lines. Clean lines can be seen in this whole look, even on the bag, and it gives to this outfit the touch of toughness that I love to approach from time to time. I absolutely love the cut of that jacket! The statment pumps are gorgeous and a perfect pairing! calling this superb would be an understatement! Streamlined, clean cut and so interesting with the addition of the snakeskin pumps. The shape of the coat is remarkable! Truly gorgeous! This outfit is just perfect! Love the jacket and the shoes are great!!! amazing look, love the shoes matching the bag. waw waw! I love a good menswear look and this is perfect with the pops of color & funky heels – great balance! Love the blazer and the bag! oh that coat really just makes the outfit!!! Wow the shoes and coat! this grey & red combination is awesome! La borsa è stupenda !!! awesome bag – goes with everything! love that minimalistic look on you ..very very beautiful! Awesome coat! You look fantastic. Such a great look! Love menswear inspired pieces! That coat is great! Such a chic and sleek looking outfit. 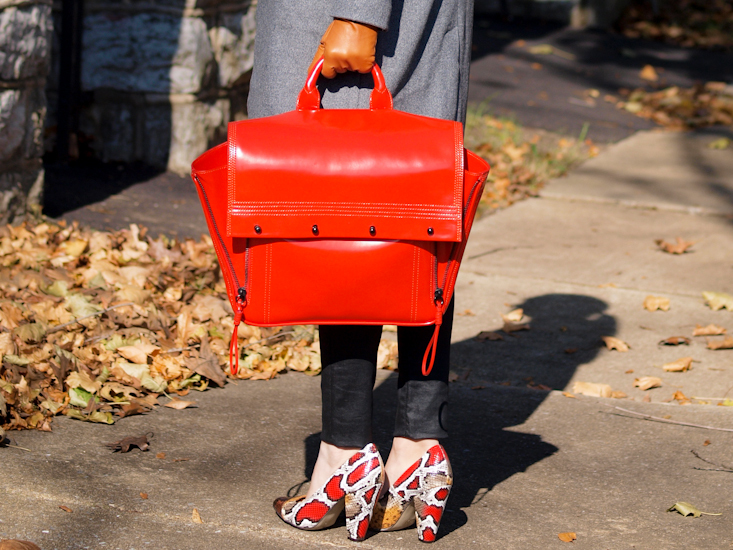 I love the menswear inspired coat and the red bag is just a perfect touch. WOW!!! you look stunning Vero! I love the minimalist look with the bright reds! This whole look is fabulous, but those shoes!!!!!! So great! I hate sometimes that my English is not good enough to describe what I feel when I see your pictures!!! This is SUCH an elegant outfit, indeed with masculine inspiration but yet SO FEMININE!! !Love the hair like this, makes your beautiful face even more gorgeous!!!! YES to ALL!!!!! This is a WOW look, it is a gorgeous outfit and I love your shoes. Veronica, when it comes to coats, a masculine design will always be my favourite. This coat is such a beautiful piece and I have to admit that grey and navy are ‘my blacks’, i.e. favourite neutrals! Once again, you have accessorised the ensemble beautifully with a pop of bright colour! adore this look! the coat is just too perfect! everything is perfect here! Salu, long time!!! Lovely coat, and I love the bag!!! !